Goerlich Quadruplets: One Month Old! This week has been a hard one for me, I guess I thought I'd have all the babies home by now and the reality is they are still weeks away from that dream. 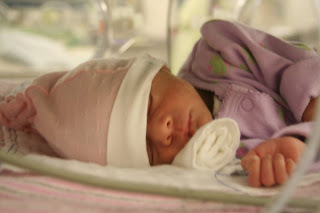 I just break down and cry at the drop of a hat, I find myself in a panic to get information about the babies and then pick it apart to figure out what is going wrong, why they aren't completely healthy and coming home right away. And then I remember that this is God's work, His timing and I remind myself to trust and have patience. Please pray for the babies growth and development and for my patience to be restored each day (or each hour - at times!). Sophia has been back in the isolette because she wasn't holding her temperature very well. When I left yesterday, they were trying her in an open crib again to see if she can do it overnight. She continues to drop her heart rate while eating, turning a dusky color and giving us a nice scare - maybe her way of keeping all eyes in the pod on her. She is still the most alert and awake, always looking around to see who's visiting her. Finn has been continuing to have breathing issues as well, mainly while eating. They are doing a PH probe study to try to determine if the little man has reflux. The theory is that reflux may be causing him to have a hard time keeping his oxygen saturation up. We should have the results of the study by Friday and then he can be treated for that if they find anything. He is still hanging out with Cohen in their big crib. Cohen is growing like a weed. He is getting closer and closer to the 6 lb mark! He had another brady the other day so the earliest he would be able to come home would be late next week. I was heart broken to not be able to take him home this week, but at the same time it's a blessing to be able to have them all in the same place for now. I'm sure juggling having some at home and some up at the hospital will be difficult. Cohen - All Dressed Up And No Where to Go! Noah is slowly going up on his feedings while going down on his IV fluids. They have discontinued the lipids which were plumping him up quite a lot and now he has lost a bit of weight. He should start gaining weight back since they are fortifying the breast milk to increase the calories that he receives. Chris talked with one of the doctors from the surgery team yesterday. The doctor relayed that Noah is doing really well. He anticipates that they will start to discuss a reconnection surgery mid-October. They want to see him gain a pound or two, to show that he is tolerating the feeds well. Chris is off of work tomorrow, yippee! We will be on the hunt for some cabinets to put in our living room to hide books and toys for the kids. Our once spacious home for two is becoming quite small with all of the goodies we have waiting for the fantasic four - so it's time to get creative with space organization. 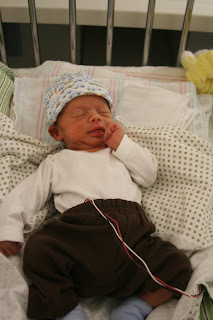 I went thru some major PPD when Andrew was in the NICU so I feel some of your pain! If you ever want to chat, give me a call or e-mail. The babies look great, and it will all happen in God's time. We're praying for you daily! We had triplets in December and I remember the heartbreak everytime they tell that they aren't ready to come home yet. It gets better I promise. Our little also had to have the same surgery Noah had and he is doing great and has caught up with his brother and sister in size. Good luck to all of you, we will be praying for you! Mari - I pray for you and the babies every day (Chris too). I am amazed when I view your blog at how far the babies have come and how they are maturing and looking healthy. "please be patient, God isn't finished with me yet"
I believe that the only way through the disappointment, impatience, etc...is to go through it - and it is always healthy to express it and not try to stuff it. "I know the plans I have for you says the Lord, a plan to give you a future and a hope"
That reflux test may be a blessing! My 15 month old was born at 36 wks and I expected him to come home with me. He was jaundice, put in level 2, and started having bradys and apnea episodes. He had every test imaginable (spinal tap, MRI, scans). 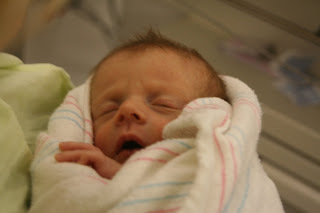 He wouldn't eat well, etc, and finally after almost 2 weeks in the NICU, they did the barrium swallow test and sure enough he refluxed after every swallow. He did not present with the "classic symptoms". They started him on Prevacid and the bradycardias were gone by the next evening. From there it was just waiting on the sleep study results (frustrating wait) and we were on our way home. He came home on an apnea monitor but it never went off (other than false alarms) and we were done with it by 4 months of age! (my twins were on them 10 months...another story!) Good luck, and hang in there. I know you want out, but just remember that there is a reason for everything. God wants those babies together a little longer before the craziness begins at home. Take care! I found you through a blog trail, and your comments inspired me to leave a message. I remember that feeling all too well. 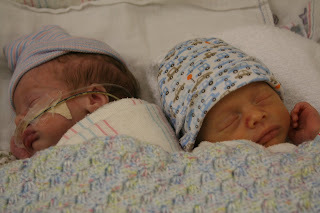 My twin boys spent nearly 6 weeks in the NICU and it's so hard at the point when you are just so ready to have them home. Hang in there! Continued blessings for your family! Someone already said it, but I'll say it again. You have been through alot! Don't worry about letting your emotions out for a moment, we see your faith and love shine through. That is what I was drawn to when I started reading your website first and then the blog. I can't wait to see those beautiful babies, but I also know God will bring them home when He knows they are ready. We are praying for you everyday!